FULL OF VARIETY! - Remember last Christmas when you bought your cat a brand new toy, only to find it discarded by Boxing Day? With The Natural Pet Company Cat Toys Megapack, your cat will enjoy endless fun and most importantly variety when playing with our feathered toys! There's so much to choose from, they won't be able to contain their excitement! VALUE FOR MONEY! - Our megapack includes seven unique toys, giving you a box full of fun to share with your cat at an affordable price that will leave you wanting more! Quality and quantity are both important for your pets. Why pay for one toy when you can have a whole box? NATURAL MATERIALS! - Each toy is made from natural wood, sisal, elastic and feathers, so you can have peace of mind whilst your cat gets busy developing their hunting skills and imagining they're fighting a real bird or mouse! This not only means your cat is safe, it also avoids dead animals being brought into your home by encouraging them to play inside! LONG LASTING! - The Natural Pet Company pride themselves on good quality, natural products that are safe for you and your pets to use. Because they are so well made, they last a lifetime and will see your cat through from kitten to adult. So what are you waiting for? Click to add to cart now! BUILDS RELATIONSHIPS! - Whether you've got a tiny kitten or an elderly cat, our toys provide a fun way to get them exercising and engaging with you. There's nothing better than seeing your cat run and chase their favourite toy, then settle down for a snooze after a successful playing session! Remember last Christmas when you bought your cat a brand new toy, only to findit discarded by Boxing Day? With The Natural Pet Company Cat Toys Megapack,your cat will enjoy endless fun and most importantly variety when playing withour feathered toys! There's so much to choose from, they won't be able tocontain their excitement! 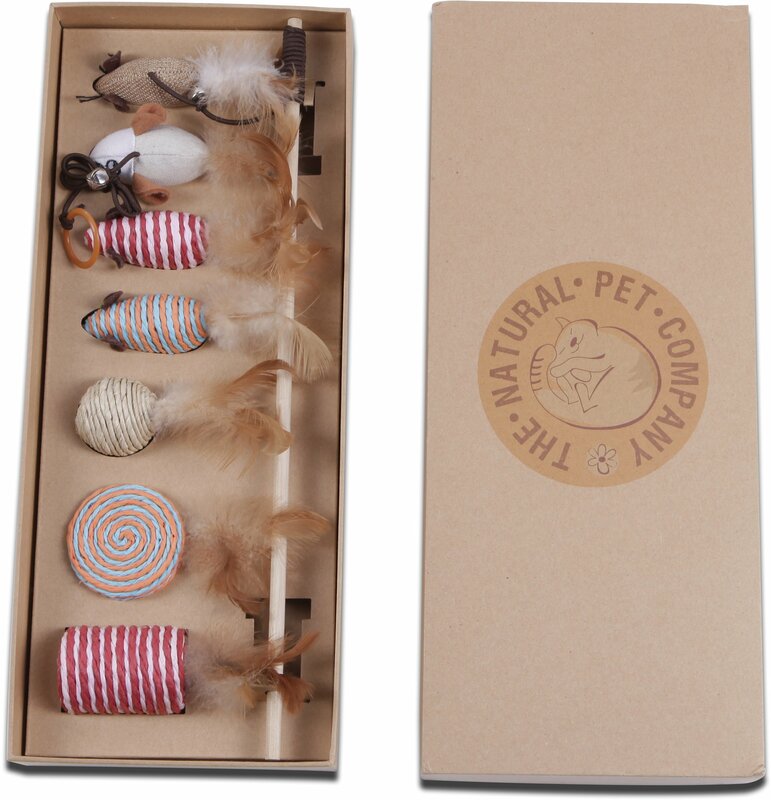 Each toy is made from natural wood, sisal, elasticand feathers, so you can have peace of mind whilst your cat gets busydeveloping their hunting skills and imagining they're fighting a real bird ormouse! This not only means your cat is safe, it also avoids dead animals beingbrought into your home by encouraging them to play inside! Whether you've gota tiny kitten or an elderly cat, our toys provide a fun way to get themexercising and engaging with you. There's nothing better than seeing your catrun and chase their favourite toy, then settle down for a snooze after asuccessful playing session! Our megapack includes seven unique toys, givingyou a box full of fun to share with your cat at an affordable price that willleave you wanting more! Quality and quantity are both important for your pets.Why pay for one toy when you can have a whole box? The Natural Pet Companypride themselves on good quality, natural products that are safe for you andyour pets to use. Because they are so well made, they last a lifetime and willsee your cat through from kitten to adult. So what are you waiting for? Clickto add to cart now!